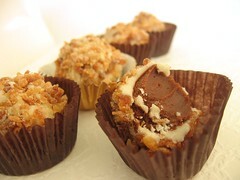 South of the Border Truffles - Do You Know The Muffin Man? Notes: For Cinco de Mayo, I decided to make an unusual truffle from this book. It calls for pineapple puree, Mojito-flavoured liqueur, dried pineapple and chile powder. While I didn't follow the recipe to the letter, I tried to keep the spirit of the chocolates intact. I briefly infused the cream with a morita chile, a smoked red jalapeno pepper, to add a subtle smoky flavour. Lee Kum Kee chili oil replaced habanero oil, lime vodka replaced mojito liqueur and I skipped dusting the truffles with chile powder. In the second batch, I added some peppermint extract to make it more mojito-like and increased the chili oil for more heat. The outer coating was a bit problematic: I diced the pineapple as fine as I could, but didn't have raw sugar, using white granulated instead. The food processor was unable to chop the pineapple much smaller, but did grind the sugar down to almost a powder. This resulted in a crisp, sandy shell around the chocolates. One of the predominant flavours comes from the tang of the dried pineapple, something I thought was a little overpowering. Next time, I would roll only the bottoms of the chocolates in the coating (and use large crystals of raw sugar as well). Another lesson learned was that I need to wait a minute or so for the white chocolate to harden a bit before rolling the truffles around in the coating. All in all, this was a very interesting flavour combination, full of subtlety and unexpected tastes.